In early December 1922, Ernest Hemingway was in Switzerland on assignment as a correspondent for the Toronto Daily Star, covering the Lausanne Peace Conference. The journalist and editor Lincoln Steffens was also there. Apparently, Steffens was impressed with Hemingway’s writing and asked to see more. Hemingway cabled his wife, Hadley in Paris and asked her to bring all of his writings to Switzerland. She quickly packed all of his fiction and poetry, including carbon copies that she could find and hurried off to Gare de Lyon train station. At the station, she got a porter to carry her luggage to the train compartment. During the very brief period when the bags were out of sight, the valise with the manuscripts was stolen. So what did the thief do with the valise once he realized it only contained the scribblings of an unknown writer? Did he throw it into the Seine? Burn them? Hide them away in an attic? Or is there a more provocative and unforeseen twist? Of course, this is one of literatures great mysteries, these lost manuscripts of one of America’s greatest authors that today would be worth more than their weight in gold. But what if they did survive? Shaun Harris tackles this literary “what if” in his debut novel The Hemingway Thief. Henry “Coop” Cooper is a successful but discontented romance novelist who is questioning the trajectory of his career. He yearns to become a serious writer and is in need of a jumpstart that will propel his literary credibility. To clear his mind he’s taken refuge at a low budget beach resort in Baja, Mexico, where he befriends the motel’s eccentric owner, Grady Doyle. The duo soon become entangled in a deadly escapade involving the theft of Ernest Hemingway’s original manuscript to A Moveable Feast, a rare piece of literary history that reveals provocative and unpublished clues to the possible location of a suitcase which contains a treasure trove of the author’s early unpublished works that were stolen in 1922. In this suspense filled and surprisingly humorous novel of cat and mouse, Coop and company trek across the cartel-laden Sierra Madre in a ramshackle RV in search of Hemingway’s fabled suitcase, finding themselves out of their element at every turn. For Coop this experience could become the storyline of a book of a lifetime . . . that is if he can live long enough to write it. On a whole the plot construction of this south-of-the-border historical themed thriller was a little silly and occasionally confusing, although it most certainly was not predictable, which is always a pleasant surprise with a debut novel. The story is filled with stereotypical crime thriller type characters, which is not a bad thing. The overall tone of sarcasm of the good guy protagonists Coop, Grady, and their cohorts (who are always ready with a witty wisecrack), reveal them to be more smart alecky than tough guys was a little bit over the top. Many readers will find the bloodthirstiness of antagonist, Newton Thandy, a conman, gunrunner, and rare book collector to be particularly unique and entertaining given that these “vocations” normally don’t coexist. On a whole the narrative moves swiftly along and is filled with numerous comical and poignant pop culture references. The premise of the book is quite exceptional, a blend of literary history and suspense, mixed with a pinch of comedy, buddy adventure, and crime thriller. 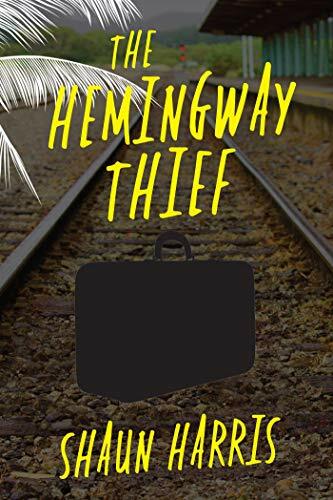 Overall, The Hemingway Thief is a quick and worthwhile read for anyone interested in an amusing crime thriller or anything relating to Ernest Hemingway.